About 65% of the total population of Africa are below the age of 35 years, and over 35% are between the ages of 15 and 35 years – making Africa the most youth full continent. By 2020, it is projected that out of 4 people, 3 will be on average 20 years old. About 10 million young African youth arrive each year on the labor market. The African Union envisions and is striving for an integrated African economic social, cultural and political development agenda: A prosperous Africa at peace with itself and its partners. Clearly an emergent and integrated Africa can be fully realized only if its demographic advantage – “large population of youth” is mobilized and equipped to help drive Africa’s integration, peace and development agenda. This vision emanates from the belief and conviction that a strong and accountable leadership and successful integration needs to be anchored on participation of the key segment of the population of which the Youth are an essential pillar. Against the foregoing and in light of, the great potential, dynamism, resourcefulness, resiliency, and aspiration of African youth, the continent continues to face daunting challenges of maximizing benefits from this critical social capital by for example, adequately investing in its growth and enrichment. 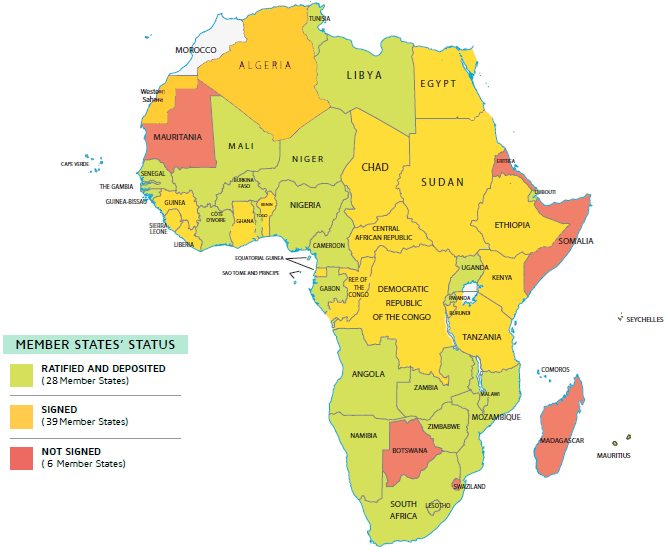 The African Population is estimated to be more than 1 billion people of which 60% are youth. The greater proportion of this percentage does not have the opportunity to fully develop its potential and contribute effectively to the realization of the declared Vision and the Mission of Africa’s leaders. 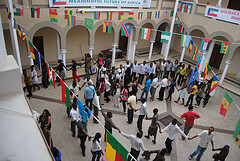 Consequently the majority of African youth continue to face; unemployment, underemployment, lack of skills, relevant education, access to health-related information and services including those related to diagnosis, treatment, and care of those living with HIV and above all prevention of new HIV infections among them. Along with other groups such as women and the disabled, the youth bear the brunt of internal and external crisis, be it those related to financial, food and energy crisis amongst others. In addition, many disadvantaged youth are unwittingly conscripted into armed struggle, used to settle political scores and are exposed to various negative media that erodes their positive heritage- leading them to delinquency, drug abuse, and other risky behavior. Furthermore and as is well known, most youth that migrate to foreign countries or even within continent, in search of greener pastures also face exploitation and mistreatments among other things. Obviously, the Vision and Mission of the African Union and the NEPAD goals of Africa’s renaissance would be realized not only through economic growth but also deliberate efforts to accelerate social development that gives high priority to youth empowerment and development. At national level, there is full recognition of the dire challenges and great opportunities the youth presents and most African countries are making efforts to involve young people in political and decision making processes, as reflected in the establishment of national youth parliaments and youth appointment in executive positions and consultation with young people on policies and programmes that affect their lives. At regional and continental levels, Youth networks have been established including the Pan African Youth Union to serve as a channel for youth engagement and for conveying youth perspectives for integration into national, regional and continental policies strategies and programmes. Adopted and approved the African Youth Charter (2006) which as of date 37 countries have signed and 21 have also ratified. The Youth Charter is a comprehensive framework that addresses the rights and obligations of young people. It also constitutes the social contract of the State and the Youths that responds to the priority needs regarding their development and empowerment. Adopted the plan of Action of the second decade of Education (2006-2015) to emphasize the need for higher, quality in African Education at all levels. The International Youth Year 2010 declared by the United Nations General Assembly (UN GA) offer an excellent opportunity to undertake National, Regional and International activities in favor of promoting dialogue and mutual comprehension, particularly through effective participation of Governments and young Africans in the United Nations Conference on Youth. Despite, the conducive policy environment created at the country, regional and continental levels, major challenges still exist. These challenges are a result of multiple factors including the development stage of most African countries and the gaps in-between policies, strategies and their effective implementation. This is not backed by adequate budgetary allocation to support and scale up effective and evidence-informed youth programmes. 4. Non-availability of productive employment and self-employment for a good majority of young people; consequently the exclusion of the critical mass which is indispensable social capital required both for economic growth and social development. 8. Inadequate availability of comprehensive and age appropriate sexuality education for in and out of school youth coupled with high level of sexual exploitation and gender-based violence in many countries. 9. Inadequate absorptive capacity of academic institutions including those of higher and technical learning. 11. Poverty among the youth remain a great challenge. – Current efforts towards the promotion of peace and security through advocacy for; dialogue and reconciliation among conflicting parties; avoidance of undemocratic change of government; and the establishment and contribution for the operation of the AU peace keeping force. Establish and strengthen a directorate of youth development within the AU to ensure effective coordination, monitoring and evaluation of youth development interventions. 8. Expand access to quality sexual and reproductive health services including those preventing mother to child transmission of HIV and ensuring safe motherhood and planned-parenthood for all young Africans. Clearly, the implementation of the African Youth Charter, and the Plan of Action for the Decade (2009-2018) and the African Youth Volunteer Corps cannot be implemented fully without international collaboration. Thus, this African position on youth presents an opportunity for coordinating and harmonizing national, regional and international efforts geared at the realization of Africa’s objective pertaining to youth development and empowerment. Africa calls on all stake holders for full support in the implementation of these priority areas! A Framework defining Africa‘s Youth Agenda! Work needs to be done to domesticate and implement the African Youth Charter. Law makers should align national laws and policies with the provisions of the African Youth Charter. Youth Rights and Responsibilities should specifically be made enforceable in respective constitutions and other laws of member state. The specific duties imposed on Member States in the African Youth Charter vis a vis observing the rights of young people may involve huge financial implication. However, to avert non implementation after transformation, Member States should amend their constitutions and other related laws to impose an obligation on governing bodies to embark on time-bound progressive implementation of their duties by providing specific percentages in their national budgets to carry out such duties. All member states are thus encouraged to take appropriate steps in ratifying and transforming the Charter. This would further strengthen the youth to play their inevitable roles in sustainable national development. Judiciary bodies, the African Human Right Commission, and higher international instances have their roles to play in protecting the provisions of the African Youth Charter by managing judicially and judiciously the issues of enforcement. For instance, it would have to accord every African Youth the locus standi to enforce the provision of the charter transformed by Member States where their national courts are reluctant about enforcement. Further, such judicial instances should adopt a liberal approach of interpretation by subsuming the rights in African Youth Charter into the civil and political rights in the various national constitutions. Member States are expected to have Youth Ministries which shall be strengthened to execute the legal and policy frameworks aimed at empowering the youth. A very few Member States (e.g. South Africa) have taken an examlatory lead in establishing of a National Youth Commission to contribute positively to the political, sociological and economic employment of the disadvantaged members of the society.